Lebanon’s first water laws date back to Ottoman times. They were later amended during the French Mandate and after independence. The Lebanese water sector was restructured following a revision of its legal framework in 2000, which led to the adoption of Law 221 in 2000 along with a number of by-laws which were adopted in 2005. Among others, this led to the reorganization of 22 water boards into four regional water establishments and gave the Ministry of Energy and Water a key role in managing the sector. As in many other countries in the region, the Lebanese water sector is made up of numerous entities, which often have overlapping functions. Table 2 shows the key actors in the sector at national, regional and local levels along with their main functions. Figure 6 presents the sector’s financial flows. Figure 6. Financial flows in the water sector. Source: Fanack after MEW, 2010, updated based on personal communication with MEW, 2015. Despite persistent attempts to involve the private sector, the absence of clear laws about private-sector participation in water supply management makes it difficult to build sustainable public-private partnerships. 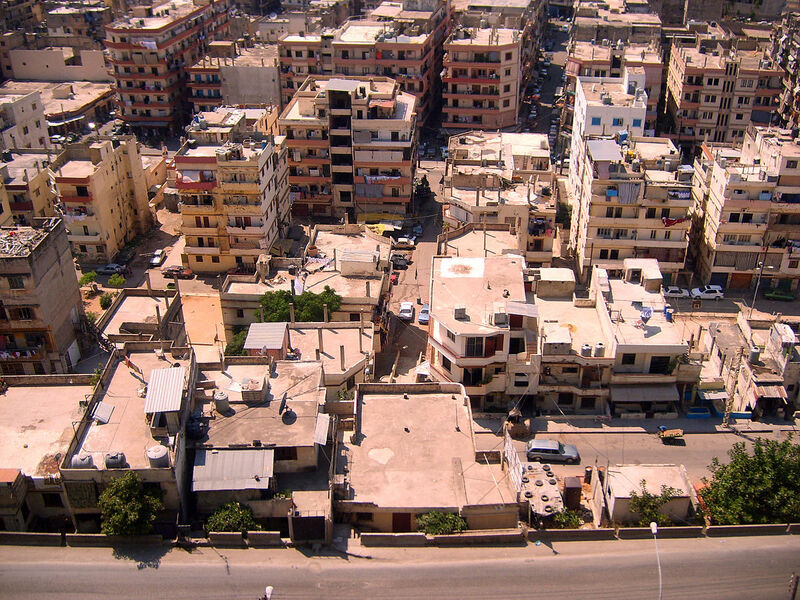 For example, from 2003 to 2007, the French water company Ondeo worked in partnership with the government on the operation and maintenance of water supply systems in Tripoli, including the organization of the billing system and fee collection. While Ondeo managed to improve both the technical and managerial performance of the authority, the contract was not renewed as no clear legal framework existed to allow Ondeo to run the utility autonomously and fully meet the contract’s objectives. Thus, absence of clear responsibilities in the water sector makes it difficult to build sustainable partnerships with private operators. 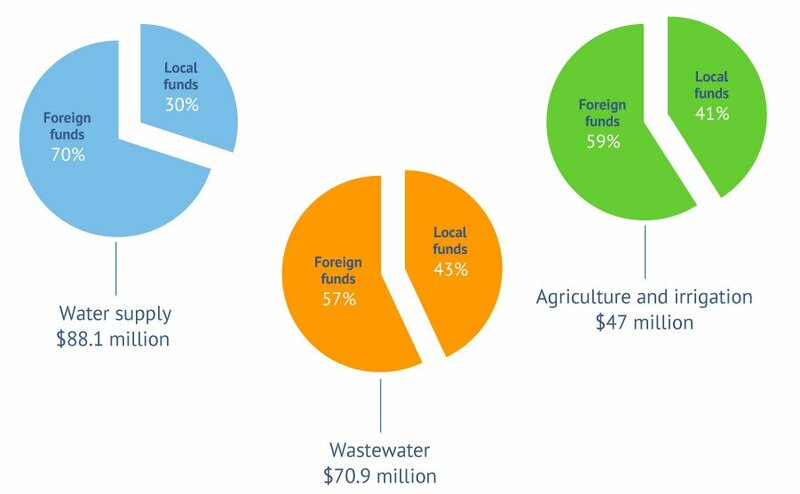 International funding agencies play an important role in developing Lebanon’s water sector in terms of capital investments in water supply, wastewater and irrigation projects, as they provide the main source of funding (Fig. 7). International donors are also very active in funding institutional capacity building and policy-related projects. It should be noted that many of these agencies/donors come in with their own agenda that may or may not align with that of the water establishments or the Ministry of Energy and Water. Furthermore, the embedding of IGO-funded personnel in ministries has stunted the capacity building of ministry personnel, which in turn leads to low morale and performance. Academia and research centres also contribute to the sector’s development as data published as part of various research projects and studies is often used in national policy reports. Civil society also plays an important role in the water sector: local NGOs are often very active and there is growing community engagement in water issues. Table 2. 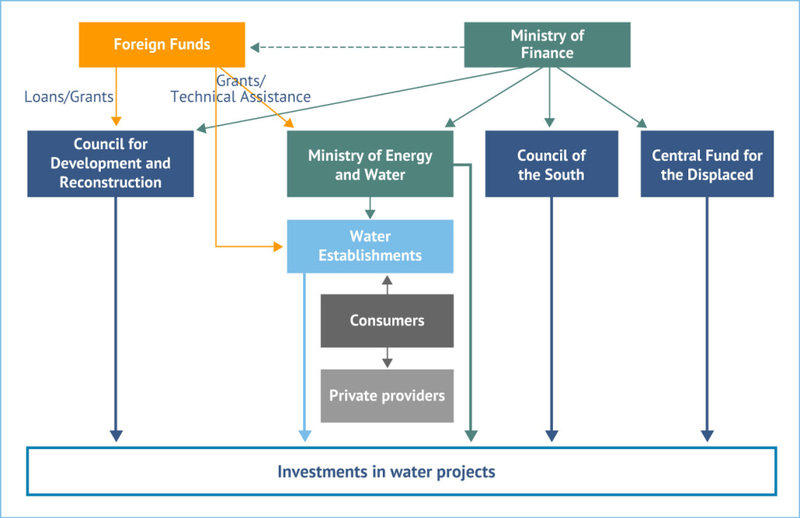 Key actors in Lebanon’s water sector and their main functions. Source: MEW, 2010; IFI, 2015. Figure 7. Sources of funding for water-related projects under CDR (1992-2012). Source: Fanack based on data from CDR, 2013b. Full law on organization of the water sector in EBML, 2011 and IFI, 2015.